Valve's Chet Faliszek says the upcoming Portal 2 is "absolutely the best" single-player game the studio has ever created. Valve's made some pretty decent games over the years. Half-Life and Half-Life 2 leap to mind. The Left 4 Dead games. Portal. Team Fortress 2. It's an impressive gallery by any measure. But in terms of sheer, all-out awesomeness, none of them, according to Faliszek, can match up to what's coming in Portal 2. "In terms of single-player experience, [Portal 2] is absolutely the best," he told The Gaming Liberty.com. "The single-player is so dense in Portal 2. It's the best." And the multiplayer side of the coin? "In terms of co-op, I'm going to say it's a tie with the Left 4 Dead series," Faliszek said. "Left 4 Dead is near to my heart." 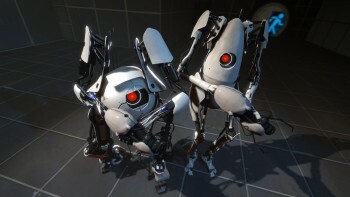 Faliszek said the team was focused on capturing the "specific vibe" of the original Portal while at the same time adding new content and and striving to enhance the experience. The story in the first game "kind of snuck up on you," he explained, but players will be aware of it right from the start in the second game, so expectations are naturally different. "That was definitely a concern," he said. "We wanted to make sure that everything we added was still Portal." He also claimed that the hugely enthusiastic response to Portal caught Valve off-guard. "We never could have guessed that it would have taken off the way it has," he added. "We didn't invent the game with this in mind. We just wanted to create a good game, with good environments and a cool world, and go from there." Portal 2 comes out on April 19 for the PC, PlayStation 3 and Xbox 360.